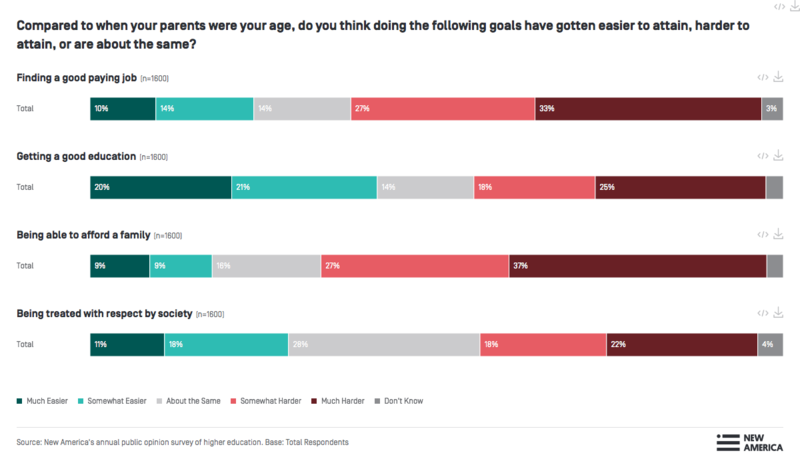 Americans say that it is harder to achieve the “American Dream,” and they are split over whether a college degree is necessary to obtain a well-paying job or to support a family. Many see plenty of room for higher ed to improve, with only one in four Americans believing the system is just fine the way it is and a college degree helps them achieve their goals, according to a new poll from New America. The nonpartisan education think tank and civic enterprise based in Washington, D.C. Thursday released findings from a new survey, “Varying Degrees: New America’s Annual Survey on Higher Education,” which involved more than 1,600 individuals in the United States who are ages 18 and older. Individuals can explore the data using an interactive tool to view the results of each survey question overall and broken down by category. Nearly three out of four respondents (71 percent) believe that higher ed is a social good for society and private sectors. The data reveal key differences across categories of age, gender, generation, region, socioeconomic status, race and political ideology, which can be seen by filtering the data using the interactive tool. There were also some unifying themes within the survey findings. Most Americans agree it's more difficult now to get a well-paying job, with some exceptions among groups of individuals. For example, when participants were asked if it is easier, harder or about the same to secure a well-paying job today compared to their parent’s generation, overall three out of five respondents said it’s harder. Filtering the results by race, however, shows that about a third of survey respondents across white, African American and Hispanic groups find it “much harder” to find a good paying job. Asian respondents were the only group surveyed with slightly less than a third of respondents answering it is “much harder,” but still more than half said it is “somewhat harder” or “much harder” to achieve this. By generation, respondents who were part of the Silent Generation were the only group who did not agree, since their parents grew up in the Great Depression. A major takeaway from the survey is that many students believe in their institutions, but feel a gap in expectations between what higher ed should be and what it currently is. Respondents feel their institution puts its needs ahead of their own in different ways, for instance, with more than half (58 percent) finding their institution prioritizes its own long-term goals above students. They also wonder how college degrees prepare them for the future workforce, with varying confidence among groups. To learn more, watch the survey findings and data tool launch event below. Further information is available on the New America site.